Create lasting impressions with your personal logo and design. The Coir entrance mat is a P.V.C backed natural Coir mat that is designed as a dirt and dust collector, and is also suitable for fitting in foot wells at your salon entrance. 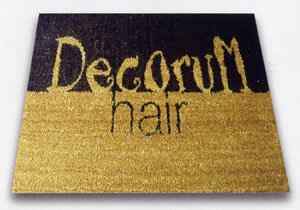 Coir mats are made-to-measure and can also be laid on any flat surface. Mats can be produced either portrait or horizontal, available in up to 3 different colours and 5 different sizes (Please use the drop down box to choose your size). We will then contact you for your logo, size and design.